Our Arizona travel guide will introduce you to one of the greatest states in the country offering unparallel experiences to all types of visitors. Arizona, the Grand Canyon State, is one of the most beautiful states in the Southwest with a variety of landscapes ranging from sprawling deserts wilderness, forests and mountainous regions and one of the best places for vacations in US. Its balmy winters and hot summers make it a desirable destination for retirees coming down from the northern US states. Its hot climate is perfect for growing various species of desert plants including enormous cacti that are one of iconic symbols of the state. Arizona offers everything from great outdoors, recreational sports, gastronomical adventures and amazing cultural encounters. The history of the human civilization could be traced back as far as 10,000 years ago on the territory of the state by well preserved ruins left by ancient Indian civilizations. One of the natural Seven Wonders of the World, the Grand Canyon (GC), is stretching 277 miles along the territory of Arizona making it one of the most well known landmarks in the US. Millions of years ago majestic Colorado River sliced the rocky landscape of Arizona creating one of the most breathtaking Canyons in the world that we are lucky to marvel at today. The territory of the GC was considered one of the sacred sites for Native American cultures that they used for worshiping purposes. Today the exposed geological formations present a wealth of scientific knowledge helping scientists learn about what Arizona could have looked like millions of years ago. Taking in gorgeous views at the Grand Canyon National Park is one of the best among Arizona vacation ideas according to multiple travel guides. The best time to come is definitely winter, early spring or late fall allowing you to enjoy much more pleasant temperatures compared to 3 digit temperatures in the summer. 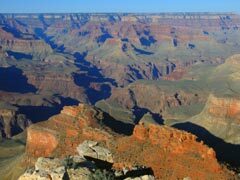 The GC experience could be attempted at two distinctly different places, The South Rim and The North Rim. The South Rim is more crowded due to its well developed infrastructure of viewing facilities and easier access, the North Rim, on the other hand, enjoys less stifling temperatures and abundance of wildlife. Today GC National Park receives almost 5 million of tourists annually making it one of the most visited attractions in the US. 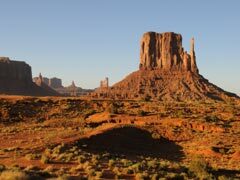 To explore other landmarks and attractions in the State of Arizona, below we guide you through several suggestions along with giving you a few Arizona vacation ideas. Phoenix the capital of the State is one of the largest metroplexes in the Southwest, one of the retirement destinations in the country and one of the sunniest cities in the US. Heat and desert are perhaps two worlds that describe the city the best, however, somehow the city managed to build itself quite a sweet reputation for golf resorts, infrastructure of museums and cultural venues and even high end restaurants. 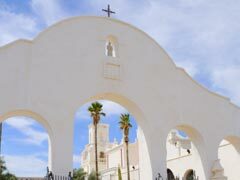 Heard Museum presented in its 3 locations presents the history and the ethnic heritage of the Southwest at its finest. Burton Barr Central Library is also not to be missed as a great example of modern architecture that artistically uses high levels of sunshine throughout the year to create a perfectly lit building outfitted with state of the art facilities resembling something from a sci-fi movie rather than a library. Desert Botanical gardens should be visited if you want to view various species of cacti in their full glory growing in the desert environment. Tucson is one of the historical towns that is also a busy college destination. Its architecture, abundance of Latino heritage and culture coupled with 19th buildings scattered across the city create a lively Arizona vacation scene. The city is set amidst a desert flatland surrounded by 5 major mountain ranges creating great opportunities for outdoor lovers. Save a day and tour city’s most famous Arizona-Sonora Desert Museum where the animal and plant species that inhabit the desert environment are displayed. Saguaro National Park is also one of the most popular Arizona attractions for stargazers and cacti lovers alike where you can see start clearly and where gigantic desert plants grow. Dive into one of the hottest night scenes in the Southwest and hit the local historical downtown where an abundance of restaurants and college hang outs are awaiting you. Sedona is the City of Red Rocks, the place of breathtaking beauty and geographical wonders that is one of the most beloved Arizona vacations for hikers, climbers and even enlightened meditators who love to practice relaxation surrounded by the primal Southwestern landscapes. The natural beauty of its geography could only be offset by an abundance of National Parks, cultural festivals, psychics and mediums, and some of the most prestigious restaurants in the Southwest. Some of the most interesting Arizona vacation ideas we can suggest for readers is to visit the Slide Rock State park that offers its visitors amazing grounds for hiking exploration coupled with one of the most “sacred” among vacationers “water holes” where they can cool off and bask in the sun after an especially hot day of Arizona vacations. You can also head to the nearby Oak Creek Canyon that opens spectacular red rock views and is also a great place to fish and hike. Do not miss the sunset and sunrise in Arizona that makes red rocks change colors and shine in unknown to you before colors. Montezuma Castle and Palatki Heritage Sights are one of the great examples of Native American cliff architecture that has been magically preserved up to this day. Flagstaff is one of the Northern cities in the State that enjoys cooler mountain breezes and vibrant cultural and nightlife scenes. Unlike its southern cities, it offers great opportunities for winter sports which are quite hard to find anywhere else in the Southwest. Snowbowl Mountain Resort is one of the best Arizona vacation ideas that offers majestic winter and early spring skiing along with its proximity to the Grand Canyon attraction located within 70 miles. Among other popular attractions in the city we highly recommend is the local Arboretum showcasing almost 2000 plant species, amazing birds and animals and great guided tours. Museum of Northern Arizona and the Pioneer Museum are among the highly coveted attractions in the city providing visitors with insight on various geological, historical and cultural aspects of Arizona. It’s our humble dream that our Arizona travel guide will inspire you to visit some of the best destinations in the country.